Railpictures.ca - Stephen C. Host Photo: Leaves rustle along the tracks while CP 8534 works hard passing beautiful fall colours along Campbellville hill, the ruling grade of the CPR Galt subdivision. For me fall is a very unpredictable season, owing to lots of clouds and the rarity of sun, plus copious family plans usually means my time spent looking for colour are limited. So I took a day off when it looked like a nice sunny day, blue skies gave way to mostly cloudy by mid morning. I had almost given up for the day by 1 PM and instead opted to press my luck, and I’m glad I did. Indeed luck was on my side as the clouds were starting to break (50-75% clouds) and I was gifted with sun at the right moments for the only afternoon trains on the Galt subdivision. | Railpictures.ca – Canadian Railway Photography – photographie ferroviaire Canadienne. 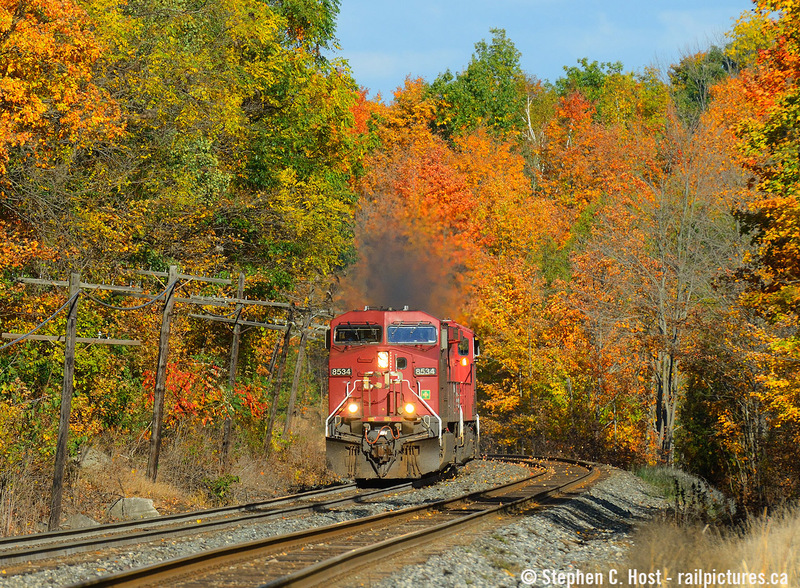 Caption: Leaves rustle along the tracks while CP 8534 works hard passing beautiful fall colours along Campbellville hill, the ruling grade of the CPR Galt subdivision. For me fall is a very unpredictable season, owing to lots of clouds and the rarity of sun, plus copious family plans usually means my time spent looking for colour are limited. So I took a day off when it looked like a nice sunny day, blue skies gave way to mostly cloudy by mid morning. I had almost given up for the day by 1 PM and instead opted to press my luck, and I'm glad I did. Indeed luck was on my side as the clouds were starting to break (50-75% clouds) and I was gifted with sun at the right moments for the only afternoon trains on the Galt subdivision. BTW brooky I was inspired by your work for this shot!! Has no one else noticed they forgot the train?? So very true Steve! Great photo. On my lunch hour, of course..